Reading this I couldn’t help thinking of the titles from Hard Case Crime that I’ve read and how perfectly it fits into the mold, Diversion offers a great ebook deal with this for people who like gritty pulp crime stories. This one has all of the hallmarks: hardened cops skirting and surpassing the law, a femme fatale, low life crooks, demented mafia kingpins, and a keen sense of period style – in this case the ’80s, which we can now look back in nostalgia not unlike the classic noir set in decades prior. There isn’t anything particularly new here then, rather tried and trusted tropes of noir and mafia crime stories, put together into a fast-paced intensity that keeps the reader engaged amid the twists of plot. Though vigilantes with questionable morals, the protagonists perfectly serve as vicarious fulfillments of that need for justice and revenge. The only downside to the novel was that moment when my brain engaged fully enough to look past the entertainment to really question the logic of the plot and the ability of Gibbons and Tozzi to avoid being offed by the baddies. Really, how long could they meddle in this stuff without being more effectively targeted for elimination? 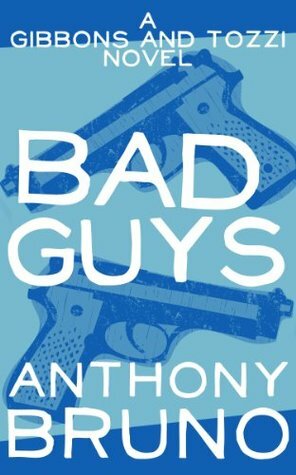 Despite this, “Bad Guys” is a simply fun book for those that like this genre, and I’d be happy to read others in the series.